Shanghai stocks tumbled by 6.41 percent at the opening, extending the previous day's losses on worsening worries over China's faltering economy and its impact on global growth, dealers said. The benchmark Shanghai Composite Index lost 205.78 points to 3,004.13. The Shenzhen Composite Index, which tracks stocks on China's second exchange, dropped by 6.97 percent, or 131.18 points, to 1,751.28. Hong Kong stocks fell by 0.67 percent in early trade. The benchmark Hang Seng Index dropped 142.86 points to 21,108.71 in opening deals. Tokyo fell by 4.13 percent in early trade, following a bruising session overnight that saw US stocks fall the most since the height of the financial crisis and European equities slump. Australian stocks reversed early losses to turn positive in morning trade. The benchmark S&P/ASX200 index had slumped 70.4 points, or 1.41 percent, to 4,930.9 at the open, having lost 4.09 percent on Monday, and more heavy falls were expected. But by mid-morning the market had turned 1.52 percent higher at 5,077.5. 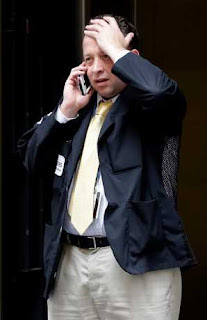 “The world's capital markets are in meltdown, and investors are asking what can stop the panic,'' said IG Markets' chief market strategist Chris Weston. 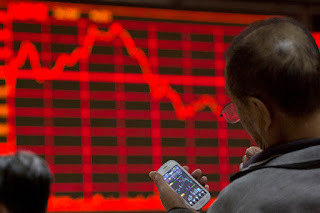 “Markets across the globe are in kind of a vicious circle now,'' Gui Haomin, an analyst from Shenwan Hongyuan, told AFP, predicting Chinese shares will keep falling for the immediate future. Some analysts suggested markets could soon stabilize, especially in the US, where economists still see solid jobs growth and higher sales of autos as signs of an improving economy. Developed markets “still look attractive,'' said an investment note from Wells Fargo that predicted the S&P 500 would hit a new record in 2016. But many see more jagged times ahead until China settles down. “The only thing that's guaranteed for the next few days is volatility, whether it's to the upside or downside,'' said Michael James, managing director of equity trading at Wedbush Securities. “There is no doubt that the panic begets panic in this market,'' Michael Holland, chairman at Holland & Co., told Bloomberg Television. Another bout of unnerving global panic-selling erupted yesterday, with some markets recording their largest one-week losses since 2008, raising fresh worries over the strength of the global economy and yet another financial crisis. Analysts warned that continuing turbulence from China would take a toll on global economic growth, especially in emerging economies. After an 8.5 percent plunge in Shanghai shares yesterday, investors dumped stocks across nearly all markets, with the main US and European exchanges repeating Friday's losses with drops of 3.6-5.4 percent, wiping out any profits earned over the past year. The carnage was even worse in emerging economies, spurring comparisons to the 1997 financial crisis, which left East and Southeast Asian economies in tatters and some seeking bailouts from the International Monetary Fund. At that time, China was stable. This time, it is the source of the turmoil. Beijing's failed efforts to calm its own capital markets and stem the domestic economic slowdown were compounded by the unexpected devaluation of the yuan two weeks ago. That sparked a wholesale outflow of capital not only from China but from most emerging economies and, effectively, a bout of competitive devaluations. Weeks later, the worries that leaders in Beijing have not yet got a handle on the country's economic problems have only grown. “What we are facing now is the increasing uncertainty over the ability of the Chinese authorities to manage the transition in China,'' Angel Ubide, an economist at the Peterson Institute for International Economics, told AFP. Already amid worries about China and other emerging economies, the IMF in July cut its 2015 growth forecast for the year to 3.3 percent from 3.5 percent predicted just three months earlier. Another downgrade could come, economists say, but mainly from ongoing problems in other emerging markets that are exacerbated by China's woes. “I do think that there are enduring factors that do imply a more enduring impact on the global economy. I don't think you can just shrug your shoulders and say, don't worry, come back in two weeks,'' Collyns said. “There is a broader malaise across emerging markets,'' he said, pointing to the political crises in Brazil and Turkey, stalled reforms in India, the impact of sanctions on Russia, and the loss of income in oil exporters like Nigeria. Even so, Collyns and other analysts were quick to dismiss the suggestion of another global financial crisis in the air. After the 1997 Asian upheaval, emerging economies freed up their currencies and capital markets, and their companies stopped depending excessively on what were once cheap dollar loans. “Back then, the whole house of cards came down. But today, with no pegs, the exchange rates are able to take some of the local heat, like a safety valve,'' said Song Seng Wun, an economist with CIMB Private Banking. As for Japan, Europe and the United States, the sources of the problems in the 2008 crisis – the banks – have gone through rigorous reforms and recapitalization that leave them far more able to handle upheavals. And central banks in all three remain on crisis footing, holding interest rates close to zero and, in Japan and Europe, still pumping liquidity into their economies to bolster growth. Since 2008, trillions of dollars in respective currencies have been injected into economies to shore up banks and spur spending, investment, and job creation. “We've long felt that the only thing preventing another financial crisis has been extraordinary central bank liquidity and general interventions from the global authorities which we still expect to continue for a long while yet,'' Jim Reid, head of fundamental credit strategy at Deutsche Bank, said in a note to clients. The support could easily continue if growth slows further. Tokyo and Frankfurt could expand their quantitative easing programs; Beijing could add to growth support; and the Federal Reserve could easily put off a planned interest rate hike. Indeed, said Stephen Oliner, an economist with the American Enterprise Institute and a former Fed staffer, ``With the plunge in global markets, I think it's unlikely that the Fed will raise rates in September'' as had been expected. Ubide argued that any talk of fresh central bank action outside of China is premature. “It looks scary, no question. But this is when central banks have to show their steady hand and keep calm,'' Ubide said. Wall Street ended up on the losing column Monday. 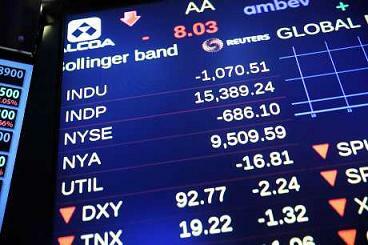 The Dow Jones industrial average briefly dropped by more than 1,000 points in a sell-off. Stocks regained some of that ground as the day wore on, but the Dow finished with a loss of 588 points, the eighth-worst single-day point decline and the second straight fall of more than 500. The Dow ended up losing 588.40 points, or 3.6 percent, closing at 15,871.35. The Standard & Poor's 500 index slid 77.68 points, or 3.9 percent, to 1,893.21, and is now in “correction" territory, Wall Street jargon for a drop of at least 10 percent from a recent peak. The last market correction was nearly four years ago. The Nasdaq composite shed 179.79 points, or 3.8 percent, closing at 4,526.25. All three major indexes are down for the year.